At about 4:30PM on Fridays, when I would *ALMOST* rather be on fire than be at work, I like to peruse potential blog post recipes online. 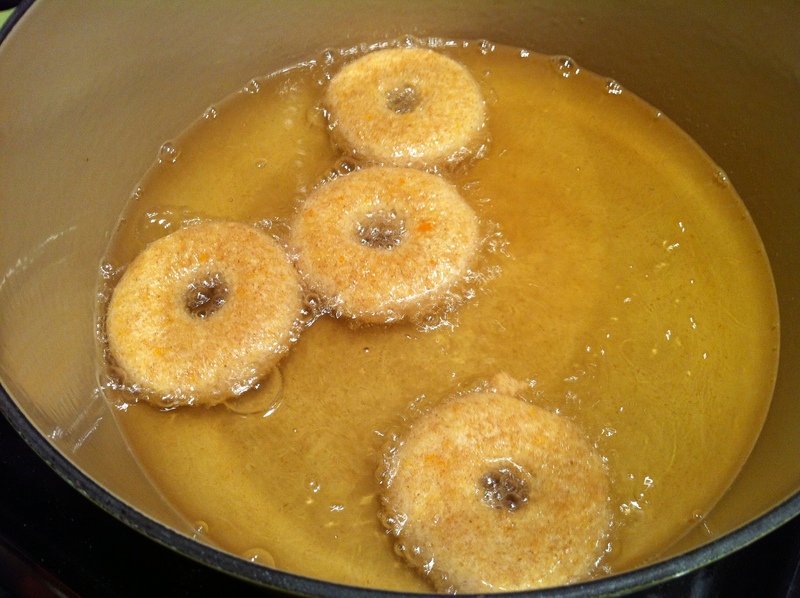 Last Friday I came across a very interesting and unique sweet potato recipe from Her Southern Majesty, Paula Deen: Sweet Potato Doughnuts. I had never attempted doughnuts before (fritters, yes, fried tomatoes, yes, mozzarella sticks, yes, but failed) so I got straight to work the next day. Combine all of the dry ingredients in a medium mixing bowl. Whisk together the eggs, sour cream, and mashed sweet potato in another. I took a little cooking shortcut for the sweet potato — just poke it with a fork a few times, then microwave on high for 6 minutes, that thing will practically disintegrate. When you mash it, make sure to NOT use the skin, and also make sure to let it cool before incorporating with the egg/sour cream mixture otherwise it will cook the eggs prematurely. 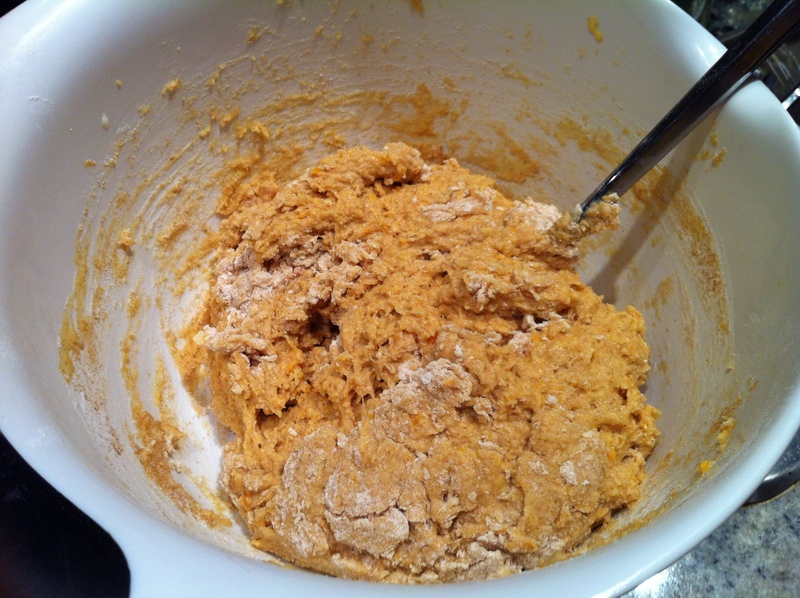 Lightly combine the dry ingredients with the wet ingredients, then turn out onto a HEAVILY floured surface. The dough will be sticky and quite difficult to work with. Knead it until it is more manageable, then roll it out into a 1/2 inch thick sheet. At this point, it would be good to heat up the oil — put a solid 2-3 inches in a heavy bottomed pot such as le Creuset, turn the heat up to medium. Cut out the doughnuts with an approximately 2.25″ round cookie cutter (or the top of a drinking glass), and then cut out the center of each with an approximately .75″ round cookie cutter, or the random protective case of a candy thermometer you find in your “Misc. Cooking Items” drawer. 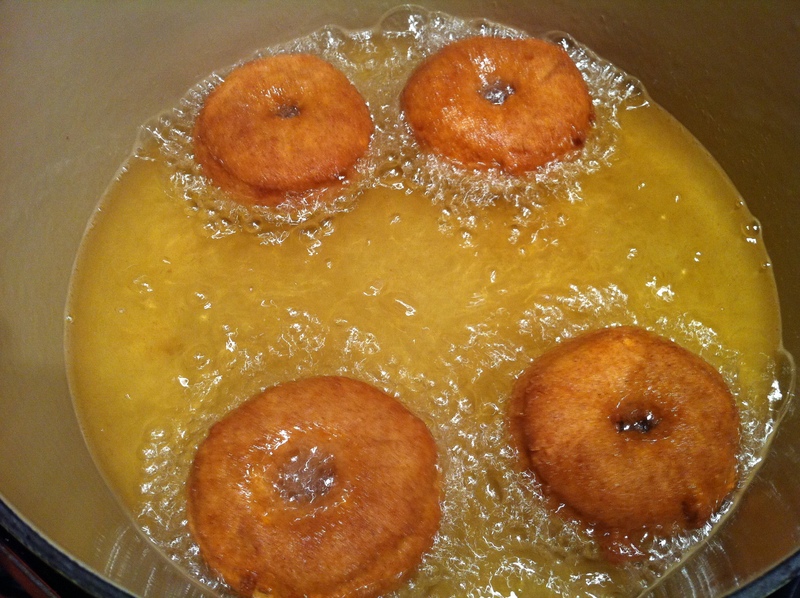 Fry the doughnuts in batches (I did four at a time) in the hot oil for about 2 minutes per side or until they are golden brown and gloriously fragrant. Re-roll the dough as needed. I got 22 doughnuts out of this recipe. 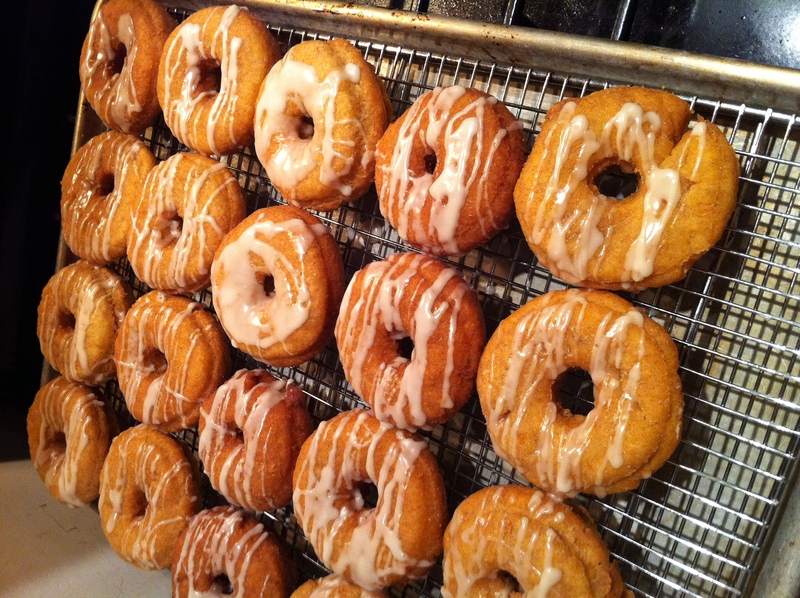 Allow the doughnuts to cool just slightly, then drizzle a simple maple glaze over the top — combine about a cup of confectioners sugar with about two tablespoons of maple syrup (or whatever looks right to you), my glazing skills could definitely use some work. It is best to enjoy these doughnuts IMMEDIATELY. After even a couple of hours they are slightly less delicious… oh well. 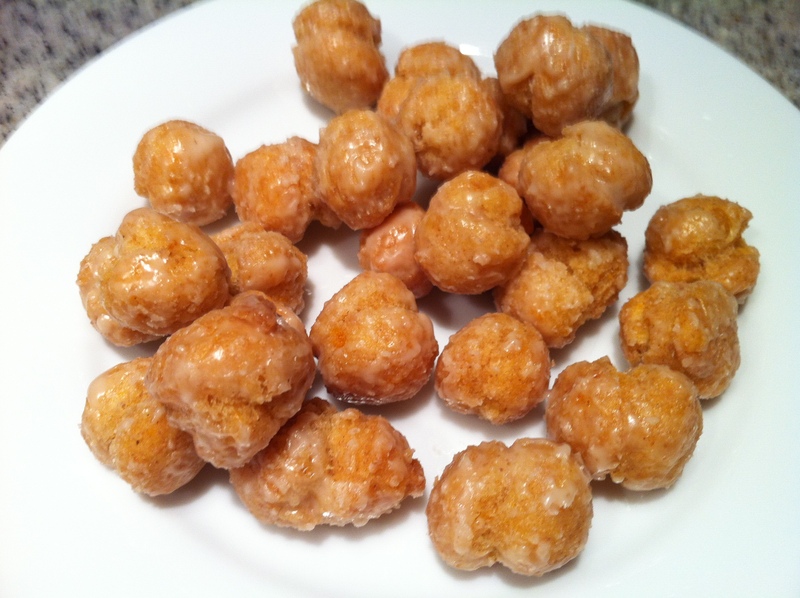 I also made some adorable doughnut holes — then mixed them around in the maple glaze until they were just divine. This entry was posted in Sweet Potato and tagged breakfast, dessert, Doughnut, Maple Glaze, Paula Deen, sweet potato, Sweet Potato Doughnut. Bookmark the permalink. Yum! Great pics and fabulous writing!